Have some free time over the holidays? Take a tour of Two Rivers, Anne Arundel County’s most significant new home community. There are over 15 gorgeous, decorated model homes by the area’s top builders throughout 1,468 acres. 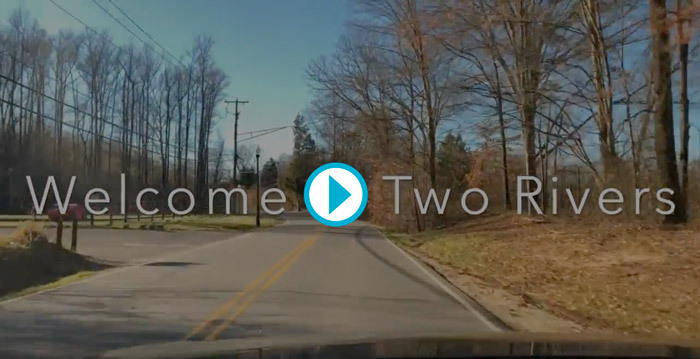 To help maximize your experience, watch the video below as we take you on a driving tour. Soak up the curb appeal of the active adult model homes by Classic Group, NV Homes, Ryan Homes, and Winchester Homes. Discover how our private 55+ Villages are centered around the award-winning 15,000 sq. ft Village Clubhouse, exclusively for active adults, featuring an indoor heated pool, outdoor resort-style pool, fitness center, yoga studio, ballroom, tennis and pickle ball courts, dog park and more! Active adult model homes start in the upper $300’s. Get a sneak peek at the striking architecture by Stanley Martin and Winchester Homes in The Cascades, the first all age neighborhood to open at Two Rivers. Blending the sophistication of the country club lifestyle, the adventure of the great outdoors, and the convenience of nearby entertainment and recreation, this is an all-inclusive lifestyle you simply won’t find anywhere else! All age model homes start in the upper $500s. At Two Rivers, you’ll find a community that embodies adventure, exploration, recreation, and entertainment. Stop by soon to see for yourself. To find the home builder that suits your taste best, and to explore photos, floorplans, and pricing, view our Home Search.